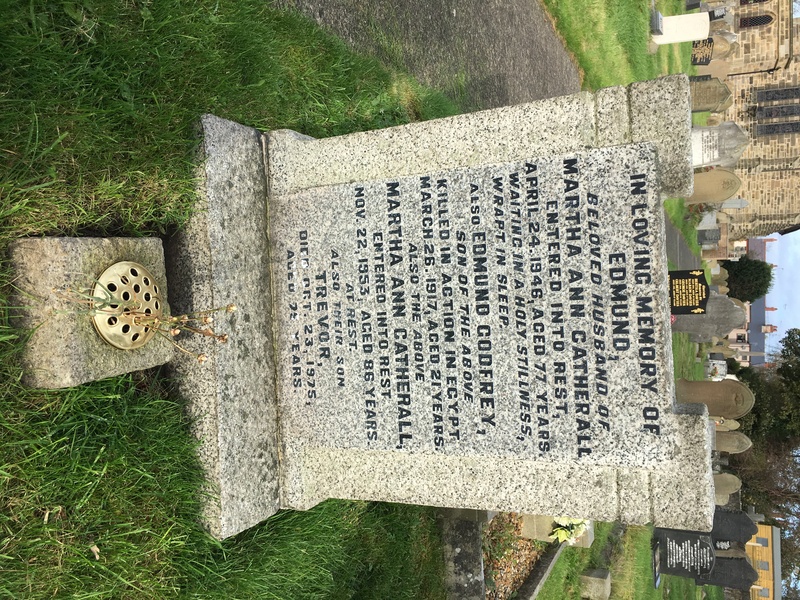 Edmund Godfrey was the son of Edmund & Martha Ann Catherall (nee Shaw) of Stanley Road. Edmund Godfrey was 21 when he died in 1917; he was not married. Before the war he was a labourer. In 1911 Edmund was employed enameling bricks; father Edmund was a timekeeper at brickworks. He had three brothers: Leonard who served in the Cheshire Regiment, Arthur and Trevor; and five sisters: Edith Randles of Frodsham, Bertha, Sarah, Martha and Mary.. He enlisted in December 1915 and he sailed on the Majestic from Devonport to Alexandria in June 1916. Edmund Godfrey’s cousin, Edmund Catherall was killed at Ypres in 1916. The fathers of Edmund and Edmund Godfrey Catherall were brothers. Edmund Godfrey Catherall was one of four Buckley soldiers who died on 26 March 1917 at the First Battle of Gaza, the others being William Cox, William Henry Hayes, and Arthur Millington. All are named either on the Jerusalem Memorial or Gaza War Cemetery. Edward Catherall from Pentrobin, named on the Hawarden Memorial, also died 26 March and is named on the Jerusalem Memorial. From an article on Wikipedia, British casualties amounted to 4,000; 523 killed, 2932 wounded and over 512 missing. The CWGC website list 175 men from the RWF who died on 26th March, named on Jerusalem or Gaza memorials, and 6 who died on 27th March. Edmund Godfrey is remembered on the family grave at Bistre Emmanuel Church.